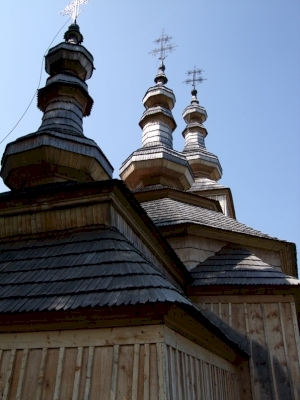 The Wooden Churches of the Slovak part of Carpathian Mountain Area are examples of local religious architecture. The eight churches consist of two Roman Catholic, three Protestant and three Greek Catholic ones. Two months ago I travelled around Slovakia and of course was aware that this site was up for nomination this year. One small problem: which of the 30 or so wooden churches would be chosen to represent them? To be on the safe side I visited 6 of them, all by car in the wider Bardejov region. A pretty example of these churches can already be found next to the skansen in Bardejov Spa - a rebuilt Greek-catholic church from 1730, originally from Mikulasova and still in use. 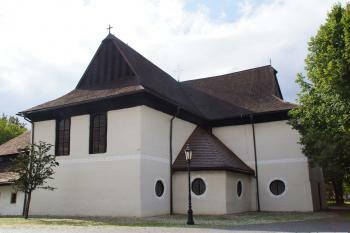 Just south of Bardejov lies the church of Hervartov: a Roman Catholic church dating from the 15th century. Its exterior is the dark kind of wood that looks like the Scandinavian stave churches. When I circle around the building, a bus full of schoolchildren arrives. The lady with the key comes running after them, and this gives me a good opportunity to check out the church interior. The lady even starts charging a 30SK entry fee and sells postcards and other souvenirs. But it's really worth it because of the original frescoes, the wooden statues and the roccoco altar piece. Much more elaborate than I would have guessed from the outside. From Hervartov I drive north again. First stop is the tiny village of Jedlinka, where the old Greek-catholic (Ruthenian) church now is overshadowed by a blinking silver coloured specimen. A sign on the church door shows a simple map of where to get the key. But I drive on this time. Next is the relatively recent (1938) church of Nizny Komarnik, located at a prime location above the village of the same name. Except for the schoolchildren at Hervartov I haven't encountered fellow visitors so far. This changes however at Bodruzal. Apparently a service has just ended here, and two women are cleaning up. They proudly show me around, and have entry tickets and postcards to sell. The prize piece here is the iconostasis, almost too big for this little church. My final visit is at the church of Hunkovce, which lies just beside the road on the way back to Bardejov. Visiting sites like these might not be everybody's taste, but this is really my kind of WHS. I thoroughly enjoy roaming around little villages and check out some local treasures. Visiting these Slovak wooden churches reminded me of a pleasant day I spent looking for churches while driving around Chiloé (Chile). And I had a relatively lucky hand in choosing 'my' churches: the ones in Hervartov and Bodruzal are now officially part of the WHS. The uniqueness of this ensemble of wooden churches - There are at least 4 other similar WHS! - can be found in the broad variety of styles given by co-existence of 3 faiths, Protestant, Roman-catholic, and Greek-catholic, in small area of Slovak Carpathians, and in the fact that all of them are still in active use of their communities. (Greek-Catholics religion is unusual combination of Catholics and Orthodox Church that still exists in eastern Slovakia with cathedral located in Prešov. As there is quite large minority of Rurthenians in Prague, they use originally roman-catholic church of S Kliment close to the Charles Bridge in Prague for purposes of their faith). This is one of on my favorite sites in Slovakia. I liked especially wooden churches of Eastern part of the country built for Greek-Catholics. There are plenty of them, ca. 30-40, in north-east corner of Slovakia close to Polish borders, and I visited many of them, but not all of them yet, during my trips to beech forests of eastern Carpathians. I was lucky in several cases, and had opportunity to visit also their interior. Only 3 Greek-Catholic tserkvas were selected according strict rules of Slovak state party. Roman Catholic churches of (1) Tvrdošín and (2) Hervartov that were interesting for me to visit but I found them not such unusual for me as I know similar churches from Czechia and Poland. In general, they adopted and expressed the wide-spread gothic and baroque style in wood. Such churches have two parts: prolonged nave with tower and prebitery with polygonal or square apsida. In contrast, Protestant churches of (3) Kežmarok and (4) Hronsek were surprising for me due to their monumentality and inner space, and I enjoyed these churches because I have never visited protestant wooden church before. It was also striking and impressive for me to see that Protestant community constructed such beautiful buildings, which are still in use for Protestant minority in Slovakia. However, their structure is also derived from universal baroque style: They have no tower, and have shape of a latin-cross central. Greek Catholic churches of (5) Bodružal and (6) Ladomírová (PHOTO) are highlight of this series for me, and it is almost unbelievable that small communities in remote and very poor parts of Slovakia were able to express their skills in these extremely monumental though small structures. The most beautiful church from the WHS series is that one Bodružal, in my opinion. It is located in tranquil village surrounded by forested hills. The church consists of three parts with three continually ascending towers - the highest is in the western part. This is typical example of LEMKOV type of church. 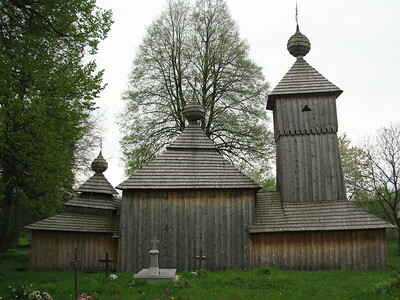 In contrast, wooden orthodox tserkvas in Poland and Ukraine (WHS) are usually of BOJKO type, where the middle tower is the highest. It means that the shape of tserkvas is not derived from universal styles, however, interior is decorated by baroque elements. It is a pity that some of churches in the region of east Slovakia were left abandoned, or in the worst case that communities sold them to museums, some of them even to Czechia (one example can be found in Kinský garden in Prague!). However, the situation was even tougher on Polish side of Carpathians due to after-WWII turbulences, and many of wooden churches were destroyed, or if they survived they are not in use because of vanishing of orthodox communities in roman-catholic Poland. The eight wooden churches of this WHS are spread over a wide area, almost across the whole territory of the Slovak Carpathians. We visited seven of them in August 2014, only Ruská Bystrá was not on our itinerary. The churches differ in their architectural style, partly due to the use of local materials and construction techniques, but mainly because they represent different faiths: Roman Catholic (Hervartov and Trvdosin), Protestant (Kezmarok, Lestiny and Hronsek), and Greek Orthodox (Bodruzal, Ladomirova and Ruska Bystra). In particular, the Protestant churches have an unusual shape. They date from the 17th century, the time of the religious repression of Protestants. The construction was subject to restrictions (like for the Churches of Peace in Silesia): they had to be built without using metal, without a steeple, outside the city walls, and had to be completed within one year. In Slovakia, the people seemed little enthusiastic to show us their churches, we had less fortune than in Poland to get access to the interior. At least that was our impression, but other visitors might have different experiences. The Roman Catholic and the Greek Orthodox churches are similar to the corresponding examples in Lesser Poland, only the Protestant churches have an unusual architecture due to their history. And though I liked in particular the one in Hervartov, I must say that I was more impressed by the sites in Poland. 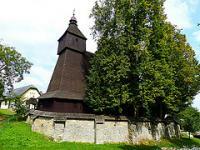 In my opinion, the Slovakian churches are the least interesting of the three wooden church WHS in this region. I visited this WHS in September 2014. This WHS is made up of 8 wooden churches in the Slovak Carpathians which bear a very strong resemblance to the Wooden Churches of Southern Malapolska and also some of the Wooden Tserkvas in Poland. 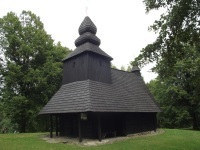 The Slovak Wooden Churches seemed to combine some of the architectural elements from both these Polish WHS. Since I had visited quite a number of other non-inscribed Slovak wooden churches earlier and mostly because I had to drive back to Poland, I only had the chance to visit the wooden church of Hervartov. This Roman Catholic church is dedicated to St. Francis of Assisi and is said to be the most beautiful and representative of the 8 inscribed Slovak wooden churches. It also proudly houses the UNESCO WHS certificate. I had saved its coordinates on my GPS but they turned out to be the wrong coordinates. As with most of the wooden churches in Poland and Slovakia, they seem to be well hidden behind a number of trees so the best thing is to be on the lookout of tall trees and when in doubt just ask for help. Perhaps if you were to visit in Autumn or in Winter it would be easier to spot the wooden churches behind the leafless trees! When I arrived at the church's doorstep, a kind man opened the door and welcomed me in. He didn't speak English or German but he smilingly pointed to the UNESCO WHS certificate and the laminated information sheets available in different languages. Again the entrance fee of 2 euros + a camera fee of 3 euros wasn't cheap (perhaps I had got used to the idea of visiting the wooden churches and tserkvas for free in Poland!). At least I didn't have to knock around or phone for the keyholder to open the church as I had to do in Poland. The latin inscriptions as well as the beautiful frescoes of Adam and Eve and the Last Supper were the highlight of my visit. I hope to be able to visit some of the other inscribed churches near Bratislava in the future. Hronsek : was easily accessible being close to its namesake railway station, on the Bratislava to Banska Bystrica line. In accordance with the laws it was set back from the main road, and built entirely of wood without the benefit of nails or bolts. This was quite a feat considering the size of the church building. Lestiny : a short bus ride from Dolny Kubin station brought me to the village of Lestiny. The church was concealed amongst trees on the slope above the village. Tvrdosin : the church in this village is located on a hillside between the bus stop and the railway station. Kezmarok : although there is a lot of timber construction here, the old Evangelical church also comprised lath and plaster walls. The town is accessible by train from Poprad-Tatry. Ruska Bystra : This was a cute little church set in a clearing in the forest. Reaching this village involved taking buses from Kosice or Michalovice, changing at Sobrance. Hervartov : With a stunning interior and an intricate design, this was the most attractive of the listed churches. It was easily accessed by bus from Bardejov. Bodruzal : infrequent buses travel from Svidnik to Bodruzal, passing Ladomirova en route. Easily found the church stood out in this tiny village. Despite ongoing restorations, the colourful interior panels were easily visible. Ladomirova : I failed to gain access to the interior of this church, but found the it in a low-lying area of the village. During my trip to the Tatra Mountains I have been to the historic town of Kezmarok (Käsmark) not far away from Levoca, which is another WHS. Kezmarok used to be another Carpathian Saxon town with typical German architecture. The town is very nice and can easily serve as a base for day trips to the Tatra Mountains. The WHS part of town is its wooden Protestant church, originally built outside the city walls. As the Austro-Hungarian rule was Catholic Protestantism was discouraged. As a result the local Protestant church had to be built outside. It was forbidden to use stone in its construction and its height was limited. The local Germans overcame these difficulties with quite an amazing construction. From the outside the church looks rather plain and this is in fact the only photo available online, but once getting inside the building, the elaborate Baroque decoration strikes you. It's design for itself is not that extraordinary but the fact it's all made of wood, straw and metal. These 8 churches are spread all across Slovakia, and most don't seem to be easily accessible. I went to the pretty town of Kezmarok, very close to Levoca and Spis Castle. The Articulate Church there is a very impressive building (more so from the inside than the outside) and is well worth visiting. It is one of the Protestant churches making up the site, which also consists of Catolic and Greek Orthodox ones. Maybe I'll go see one of those in the future. Extended from original TWHS: Originally only Kezmarok. 128 Community Members have visited.